Sometimes a rectilinear parallelogram is just too "square," and you need a triangular table. Triangular tables have more particular features than square or rectangular tables. Their angles and proportions differ individually, and they lack symmetry. Matching legs often make them look stiff and graceless. 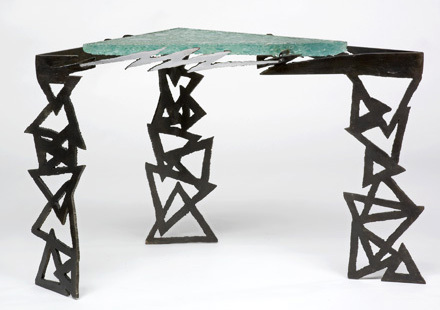 Triangular tables offer greater opportunity for creativity and expression. This triangular table concept uses a floating inset top and sculptural legs to celebrate the differences of triangular table design. The torch-cut legs are bent and twisted to show their angles, stabilize the table's three-point balance, and animate it's lively appearance.